In treating the naval aspects of World War II, this ready reference enhances the understanding of a part of the war that is often overshadowed by the fighting on land and in the air. 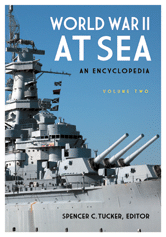 The encyclopedia focuses on the events, individuals, organizations, and ideas that shaped the world's navies during World War II, as well as the resultant battles that changed naval history. It also covers the numerous innovations that occurred during the conflict and shows how strategies evolved and were executed.